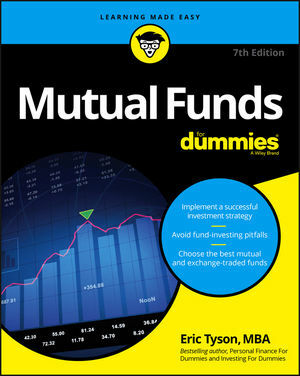 Newly revised and updated, Mutual Funds For Dummies quickly and easily helps you pick the best funds, assemble and maintain your portfolio, and evaluate your funds' performance. In no time, it gets you up and running on exchange-traded funds, tax laws affecting investments in funds, how to evaluate different fund-investing strategies, and much more. Complemented with sample fund portfolios and updated forms that show you exactly how to accomplish your financial goals, this is your trusted resource for planning and implementing a successful investment strategy that includes mutual funds. Eric Tyson is a nationally recognized personal finance counselor, writer, and lecturer. He has been featured on and quoted in local and national outlets, including Newsweek, The Wall Street Journal, Los Angeles Times, and others. He has appeared on NBC's Today Show, ABC, FOX NEWS CNBC, PBS Nightly Business Report, and CNN.